I haven’t gotten around to recapping the summer, even though school started a few weeks ago already. In my defense, summer doesn’t actually end until September 21st, right? 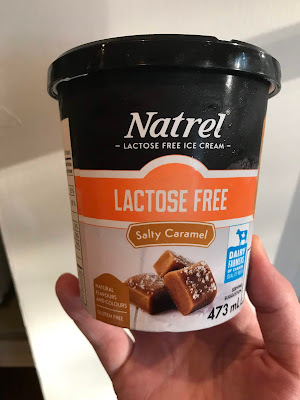 So over the summer, while in Montreal, I got to try Natrel’s lactose-free ice cream. 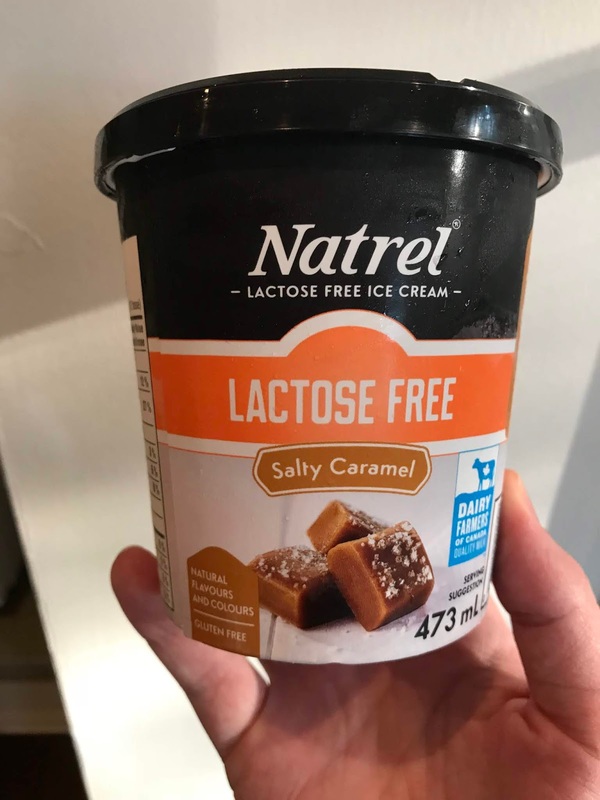 The vanilla flavor was very good, but my favorite was the saly caramel! There are five flavors in all, but I’m not sure they’re all available in Quebec – British Columbia seems to be their testing ground. This ice cream comes in small packages, like Häagen Daz or Ben & Jerry’s, but without being as fancy or as wild with the flavors. Still, I’ve always preferred that format over large tubs that get frosted over by the time you finish them. I look forward to eating more! 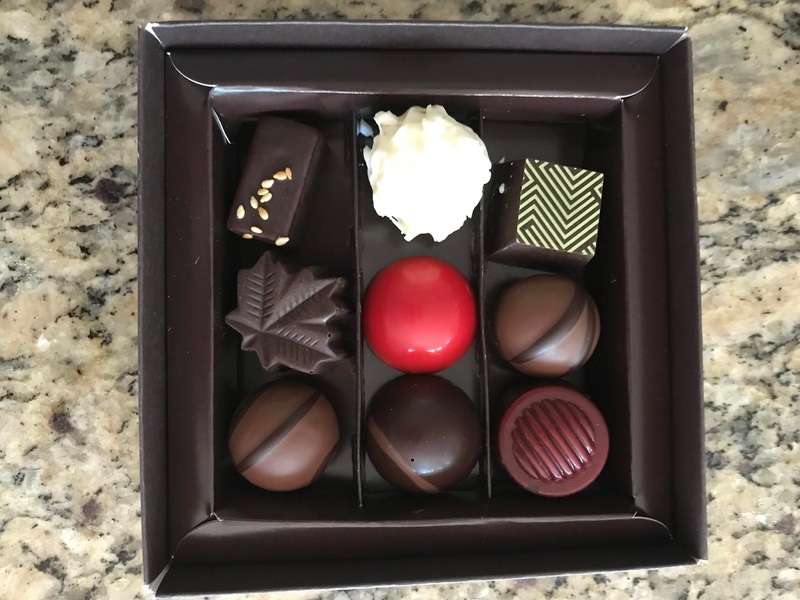 I tried assortments of chocolates from two places for the first time. There was a box of 10 jewels by Christophe Morel – presentation was beautiful, but there was no insulating packaging for shipping, so a few of the chocolate were stuck to the box; I suppose I’m lucky they hadn’t melted further! They were good, but many of them had caramel or nuts, which aren’t really my thing in chocolate. Then I bought a selection of nine at Chocolats Privilège (this is the place at Jean-Talon Market where I have bought cocoa nibs previously). These were more to my liking, because they were more melt-in-your-mouth while still having original flavors (though, to be fair, I didn’t have them shipped and don’t know how they would have compared to the other ones in that aspect). 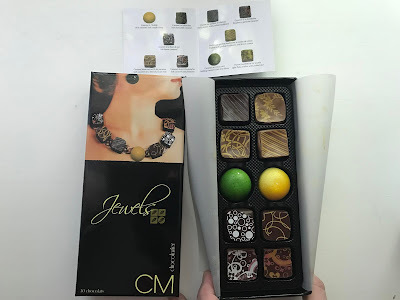 The box also comes with instructions for the best range of temperatures in which to store the chocolates as well as a “best before” date a month down the road; both these factors make me feel like the chocolate makers are more professional, though obviously that’s just an impression. These chocolates were also a bit less expensive, so all in all, that’s what I’d lean toward next time. 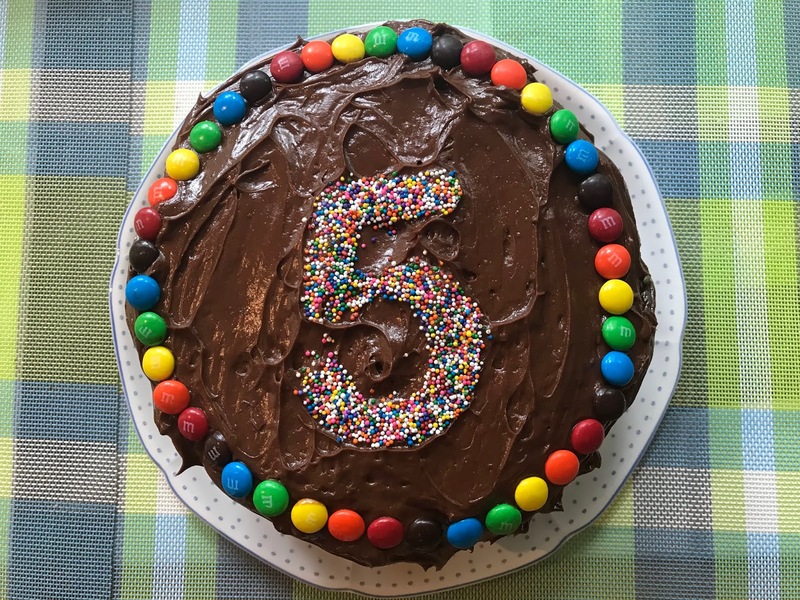 I also made a cake for the Little Prince’s birthday, following his precise instructions regarding contents (chocolate cake, chocolate frosting, chocolate chips, M&Ms, and sprinkles) and their placement (the chocolate chips are in between the two cake layers, which is why you can’t see them here). As for restaurants, the Engineer and I celebrated out tenth (!) wedding anniversary at Maison Boulud, which is in the Ritz-Carlton in downtown Montreal. I started with the acorn-fed senorio iberico ham, followed it up with the egg yolk ravioli with sheep milk ricotta and spinach coulis, and for dessert, the chocolate coolant with fleur de sel liquid caramel and caramelized milk (and obviously I had some LactoJoy to go with this meal!). Since my parents are such great babysitters, we went on another date in a nice restaurant: Chez l’Épicier, in the Old Port, which I’d been meaning to try out for a while. 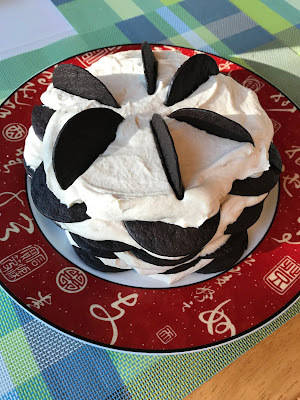 I started with the sourdough bread, wild honey and brown butter appetizer, then had the filet mignon with onions and potatoes, and finally the white chocolate aero, rose milk and pink peppercorns for dessert (more LactoJoy, naturally). Presentation was superb, and as much as I loved the food, I think I was even more enamored with the ceramic dishware. I’d have bought a few pieces on the spot! Also, my mother took me to lunch at Europea, where Jérôme Ferrer is the executive chef; the restaurant is a member of Relais & Châteaux. We had the four-course discovery menu: lobster cappuccino with truffle purée; smoked duck ham and beef tartare, fresh mustard leaves, wild souffléed rice and taro chips, heart of frisée salad; roasted Cornish hen, smoked mashed potatoes, asparagus and root vegetables, bold meat juice reduction; strawberry trifle, candies and sweets (which included tiny lemon madeleines, meringues and cotton candy). This was one of the best meals I’ve had, ever! The lunch menu also offers excellent value. This is one place where I really hope to go again! Finally, I surprised myself and bought… Crocs. See, I always thought of Crocs as unsightly clogs with holes, which only children and people with no self-respect wore. But I was wrong! I saw some shoes on which Drew Barrymore collaborated and realized I should go take a closer look in a brick-and-mortar store. To be clear, it’s not because they were designed by a celebrity, but it made me realize how stylish some Crocs are! 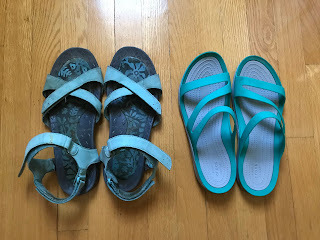 So I went and tried on a few pairs (not hers, in the end), before settling on Swiftwater sandals in turquoise, which replaced my beat-up Land’s End sandals. They haven’t even come close to giving me blisters, which is incredibly surprising for me! Granted, I haven’t worn them for long walks in the Texas heat, but we’ll see how they fare. 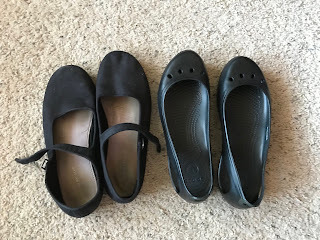 I’ve also acquired a pair of Kadee flats in black and have loved them so far. Plus, these shoes are really not expensive! I’m including two pictures with the old pair I’m getting rid of on the left, and the new Crocs on the right for comparison. It may be rubber, but it’s a step up, at least for casual occasions.